This article outlines the requirements for a SQL statement that fetches data for a Dimensioned Metric. This article also assumes that the Dimension is configured in the Dimension Editor to fetch all values in a single SQL Statement (rather than one SQL statement issued per Dimension Value). Since this is an example of a Daily Metric, both of the above date/time values would be normalized to '2012-12-28 00:00:00' and the first row in the result set would be discarded (only the value of 44 would be recorded for the specified date). If you would like to fetch data incrementally, you can include the ':last_measurement_time' variable in your SQL statement. 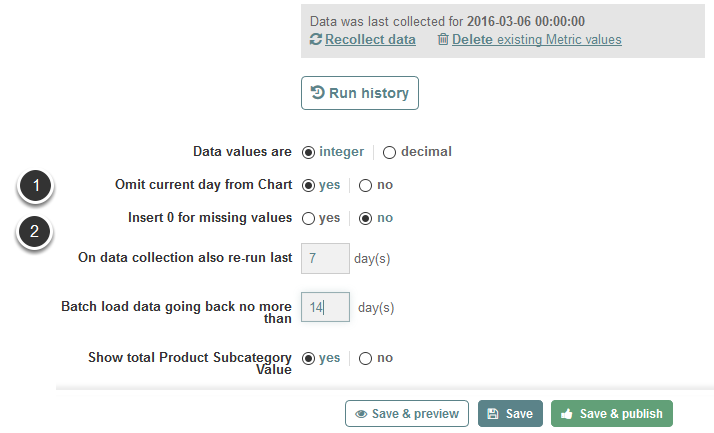 This variable is set at run-time to be the measurement time of the most recent metric value collected in the Metric Insights repository for the metric. 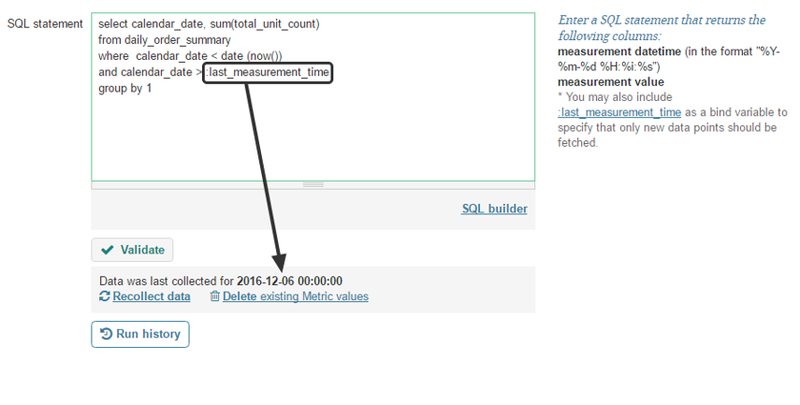 If you do not include :last_measurement_time in your SQL Statement, Metric Insights will re-fetch ALL historical values. In this case, new metric values will be added and existing values will be updated based on the result set of your query. In dimensioned metrics that are batch-collected, :last_measurement_time is set to be the earliest 'last measurement time' value across all dimension values. You can set an offset to use in computing :last_measurement_time and this offset will be used to collect additional historical data. For example, if you set up the On data collection also re-run last '7' days, the system will subtract 7 days from the last measurement time to set the :last_measurement_time variable. You can set a maximum number of days that the system will go back to collect data. This is useful in situations where you have some Dimension values that are no longer accumulating values. The value of :last_measurement_time in this scenario would normally be set to '2011-03-01' since that is the earliest 'last measurement time' across all Dimension values. If your organization is no longer doing business in Australia, that Dimension may never collect additional data and you may not want to re-collect all data from that point in time. By instructing the system to Batch Load Data Going back no more than 14 days, :last_measurement_time would be set to be at most 14 days before the latest 'last measurement time' across all Dimension values. In this example, this would be 14 days before 2012-10-02 which will result in :last_measurement_time being set to '2012-09-18'. Normally, when a new Dimension Value is created for an existing Dimension, data for an existing Metric will be collected from the earliest ':last measurement time' across all Dimension Values. You can specify that ALL available history be collected for a new Dimension value by including the '<single-fetch></single-fetch>' tag in your data fetch command. This tag will be removed from regular data collection and will ONLY be used for data collection for new dimension values. The above statement will be run once for every new product category value (with the key value of the product subcategory substituted for ':product_subcategory' in SQL). Dimensions use fetch commands to tell Metric Insights how to collect data for elements. There are two methods: single ('Each Individual Dimension Value') and bulk ('All Dimension Values at Once'). A bulk fetch attempts to retrieve all the data in one request whereas a single fetch command makes multiple requests to retrieve the data. In most circumstances, bulk fetch is sufficient so it is the default setting for new Dimensions. Although, there may be conditions where a single fetch is required. An example is when the SQL query requests three columns but the data source can only return two columns at a time. This would take more than a bulk request to gather the data, so using the single option is necessary. Imagine that a SQL table has columns for all the information you want: Sales Rep, Date, Amount. A bulk fetch can accomplish this. Now imagine that you have distinct tables named after each Sales rep, and only have columns Date and Amount in those tables. A single fetch is needed to query all the tables to get the same information. NOTE: Metric Insights will tell you what you need to return in the SQL query. Look at the notes to the right of the SQL Statement box and it will define the columns to include or to use the bind variable in the clause.